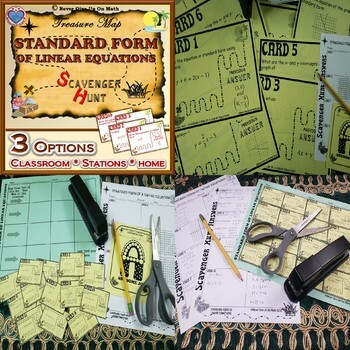 The Scavenger Hunt activity focuses on working with find the "Standard Form" of a line using the different givings. My kids loved this activity and found it beneficial. Hopefully yours will find it enjoyable and helpful as well :-) In some classes I ran this activity in class while in others I assigned it at home or in groups. In both cases, students LOVED it. This activity maybe used as a review before an assessment on this concept. Students will feel better after this activity as they understand the concept better while working as a team. After you assign the first card, students will locate the card around the room and answer the question on the card. Then, after solving the question with their partner (or group or individually), student will find the answer as it is placed on another card around the room. Then, student will answer the question on that card repeating the process. Students will utilize the Scavenger Hunt Answer form to keep a record of their answers as well as their sequence. I will strongly encourage that student show work and attach it to the answer form. I have attached a visual organizer of the findings which would help in checking out the sequence quickly. It is an"A"wesomecard which could be given to every student. You may choose to print 1 per page or 4 per page. Both printing options are included in this product. This activity is a great tool for differentiation. It could be used as a review before a quiz or a test on this topic, TASK CARDS, Cooperative Learning, ... et .. 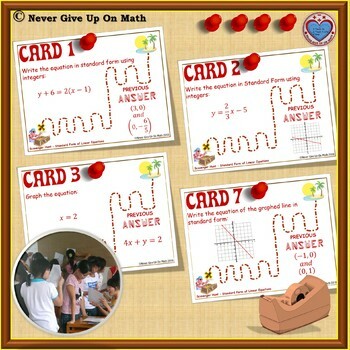 It is a great way of "Cooperative Learning". It also could be used as a formative assessment. In addition to the Scavenger Hunt file, you'll find an answer form to be used by students as well as an answer key. Don't forget to check the preview. This is a new strategy that I have been using in my classroom which allows for differentiation. I have included the scavenger hunt in a small size with an organizational bulletin and a small 'A'wesome Card. 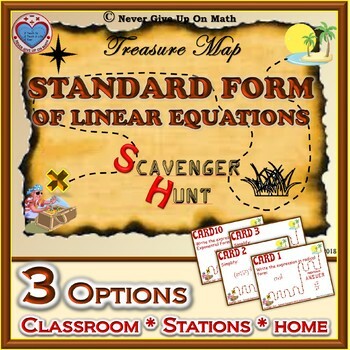 Students will simply take the scavenger hunt at home and do it instead of a homework or as an extra credit. Please visit the preview to see some pictures of the final product when completed with this option. My students have enjoyed this option and thought it was fun. I hope that your students will love it as well. ☺Would love to hear your feedback☺.Please don't forget to come back and rate this product when you have a chance. You will also earn TPT credits. Enjoy and I☺thank you☺for visiting my☺Never Give Up On Math☺store!! !